Holly Lane is a Northern Californian artist who graduated from the MFA program at San Jose State University in 1988. She has had numerous gallery and museum shows throughout the US, and she is represented by Forum Gallery, NYC. 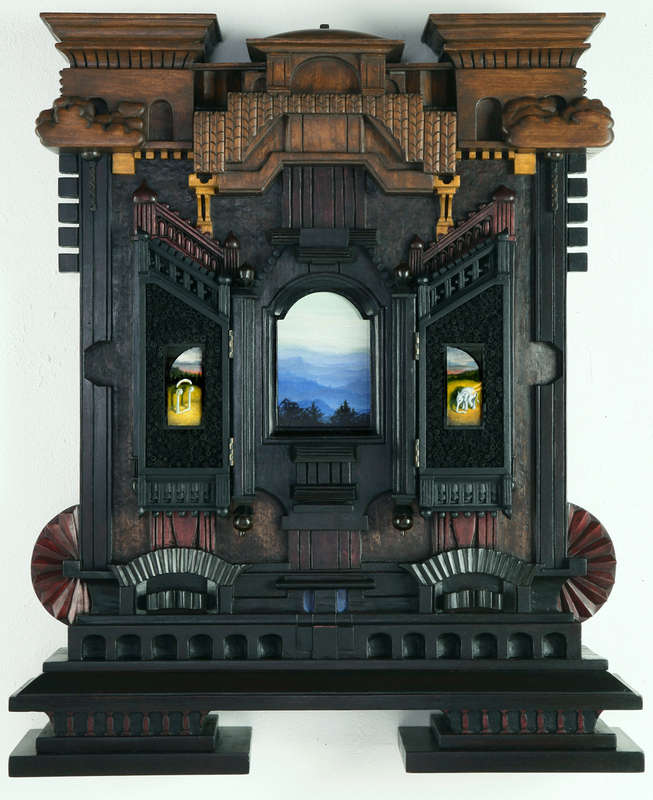 Her work balances imagery with elaborate wooden surrounds which derive from ecclesiastical sources: altarpieces, tabernacles, lecterns, etc. She is interviewed here by Steve Shriver. Steve Shriver: Well, considering that this is a blog on the subject of picture framing, maybe we should begin with that. Obviously framing is a large component of your art. What drew you to put so much time and effort into the surrounding elements of your art? 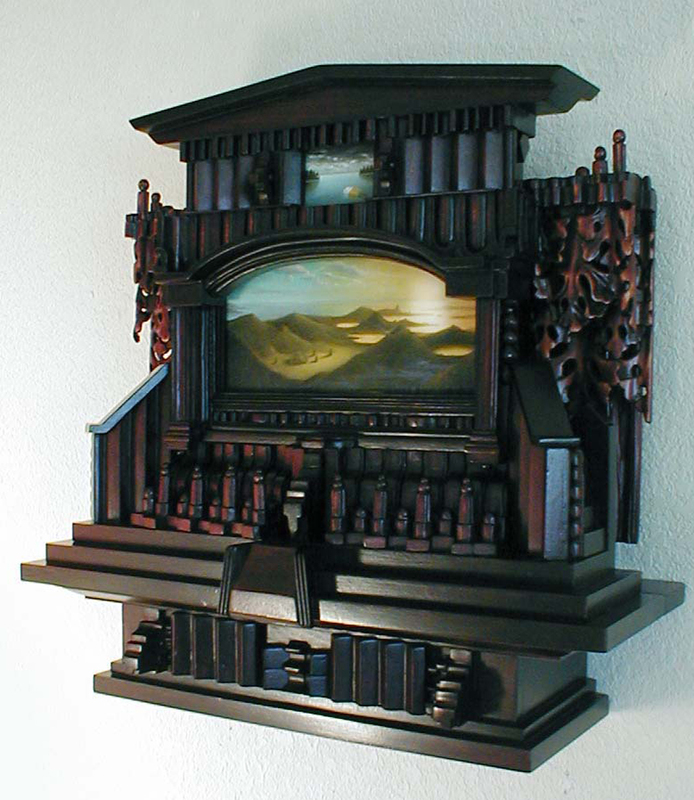 Did you have a background in woodworking or framing? 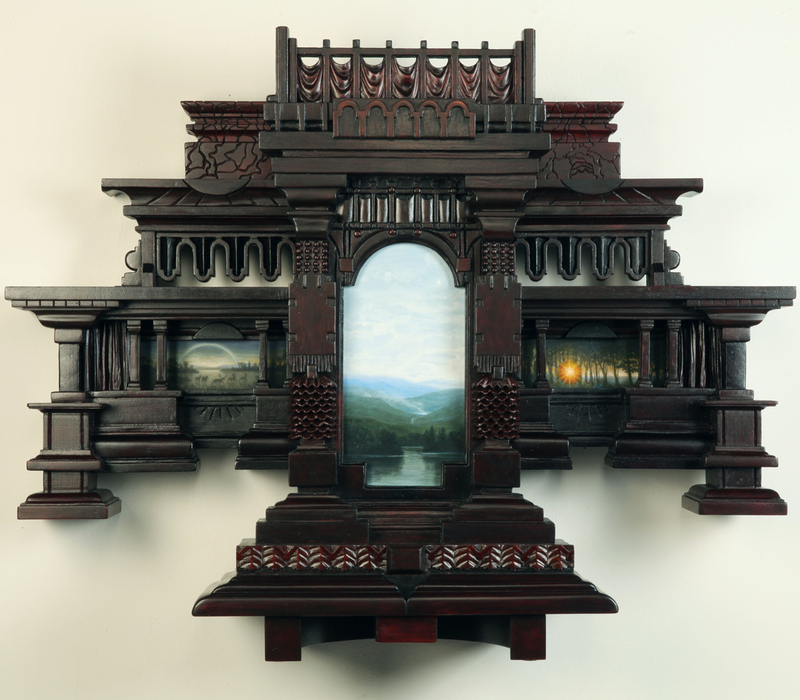 Holly Lane: While an undergraduate in painting I began to think about frames. At that time, if a painting had a frame at all, it was a thin line that served as protection for the art – it had a utilitarian function, not an aesthetic function. A good frame was supposed to be invisible or at least, inconspicuous. While pondering the practical and philosophical nature of frames, I found some illuminated manuscripts in the University library, and saw how the borders visually commented on the text, sometimes even spoofing the text. From this discovery I realized that a frame could be many things; it could embody ancillary ideas, it could be an environment, it could be a shelter, it could be an informing context, it could be in dialogue with the painting, it could extend movement, it could be like a body that expresses the mind, and many other rich permutations. From that point I began to create pieces that fused frame and painting, with some pieces having doors that open and close over paintings to suggest; contingency, potentiality, future, past, or cause and effect. Some recurring themes in my work are: nature mysticism, interspecies compassion, exploring what is hidden in a myth by positing a back-story or the next chapter of a myth, re-presenting women from a women’s perspective – as thinkers, proofs of cognitive processes in animals, for example; pretence, correction of errors, recognition of other minds and curiosity. By the way, Steve, I appreciate that you noticed my surrounds are time consuming. 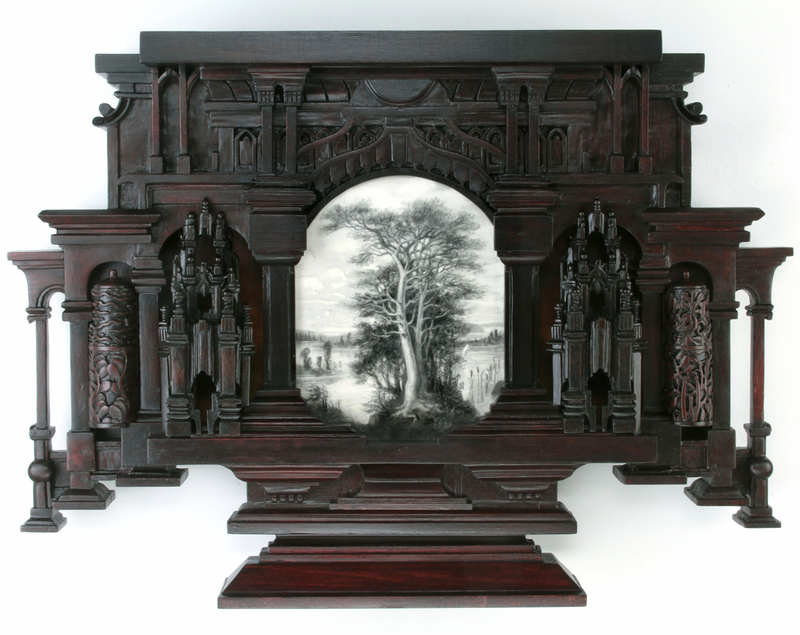 As the work has evolved, the carved frames have come to take as long or longer to create than the paintings. At forty or more hours a week in the studio, it takes from one to eight months to make an entire piece – frame and painting – depending on size and complexity. My MFA is in painting; other than one project in an undergraduate 3-D class I learned about wood from books and experimentation. SS: I wish I could say that I’ve encountered your work in person, but so far I’ve only found it on the web, while researching something else I’m working on. That seems to be one of the really amazing new aspects of the web – finding things accidentally. Your work does not give the impression of being random or accidental; can you talk a little about your design process and how you think of the relationship of your paintings to the frames (I hesitate to even call them frames, they are so intricate!) Do you draw out the woodwork in detail or does it develop organically? HL: I too have made serendipitous discoveries on the web; it has thrown open the doors of the art world and beyond. In my sketchbooks I simultaneously collect and develop what I call sculptural ideas (for the frame and its components), and painting ideas. Usually I will make the frame first, with sketches for the painting nearby so that I can orchestra forms and interrelationships. I start with a thumbnail sketch of the frame, and then make a full-scale drawing of it on graph paper, so that I can take measurements from the drawing to get the proper amount of wood. Often as the 2-dimensional drawing becomes 3-dimensional I will make changes. 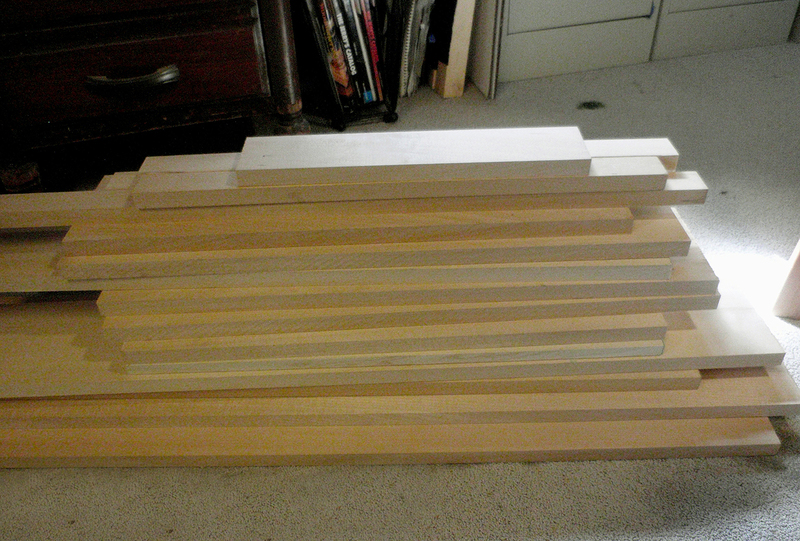 I find the leap from 2-D to 3-D spatially challenges my painter’s mind…I love that…the sense of being stumped. Being stumped makes my heart glad, because I know then I’m pushing my boundaries and I’m going to learn something. SS: There is a distinctly ecclesiastical reference in the forms of your surrounds- how did that begin? 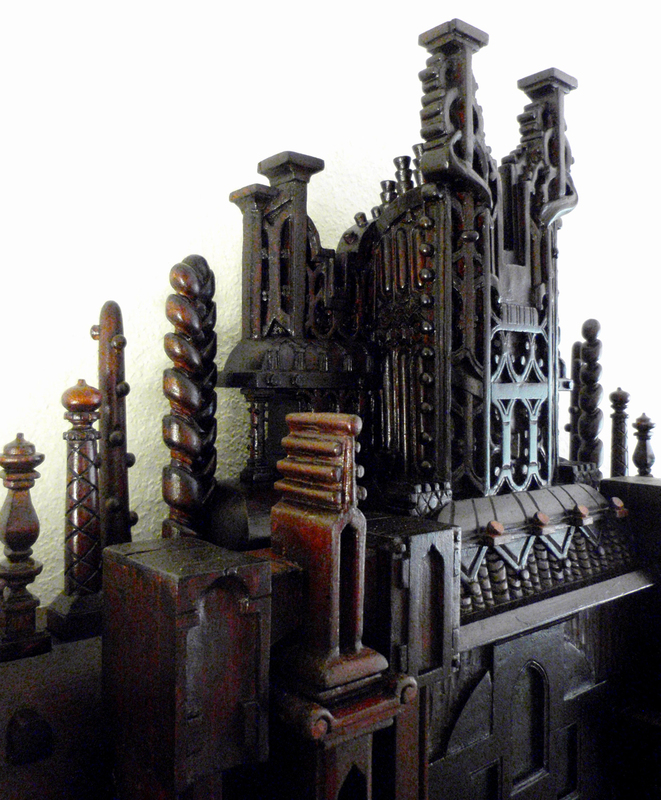 Were you always interested in those styles and forms, or was it a more spiritual influence that drew you to them? I notice also that very little of your painted imagery is overtly religious, so how do you look at that relationship? HL: I took a lot of art history in college (30 units) and fell in love with the aesthetics of the Northern Renaissance, which in large part enjoyed the patronage of the church, and therefore the Northern Renaissance substantiated an aura of the sacred into its forms. Plus I have an existential interest in the sacred as it comprises, in whole or part, the nature of being. Some qualities that attract me to the Northern Renaissance are a sense of cloaked meaning behind pictorial subtleties and the suspension of time – nothing feels hurried, loving attention was bestowed on every inch of the painting, sculpture or architecture. SS: Your work seems to reference many antique pieces; do you ever incorporate salvaged items, or is it all made for each piece by you? HL: I don’t use salvaged or found items; I use fresh, kiln-dried lumber of non-threatened wood species, primarily; basswood, poplar and black walnut. SS: Your work uses many traditional finishes and techniques from picture framing and furniture. How did you learn about these kinds of finishes – do you do it all yourself? HL: I do all the finishes myself. When I started, years ago, I would paint the frames with artist’s acrylic tube paint but discovered that the sensitive paint surface was susceptible to damage during shipping and handling. After having work return to the studio for repair I decided to search for a more durable, but colour-rich ‘paint’ surface for the frames. Though they’re not as easy to use and mix as artist’s paint, I settled on wood dyes, wood oil stains, and varnishes to which I can add dyes to modify the colour and sheen. 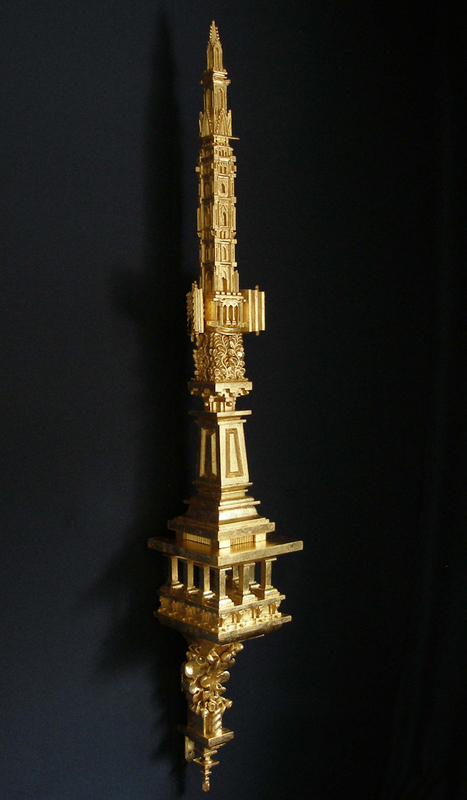 On the sculptures I use gilding. I’ve gilded two frame pieces…but feel the metal surface of the gilding pushes hard against the painting; it’s not soft and welcoming as wood stains. Again, I turned to books and experimentation to learn these techniques. SS: You reference many different periods, places, and styles in your surrounds. How does that affect the imagery, and which comes first – image or the frame it’s going to live in? 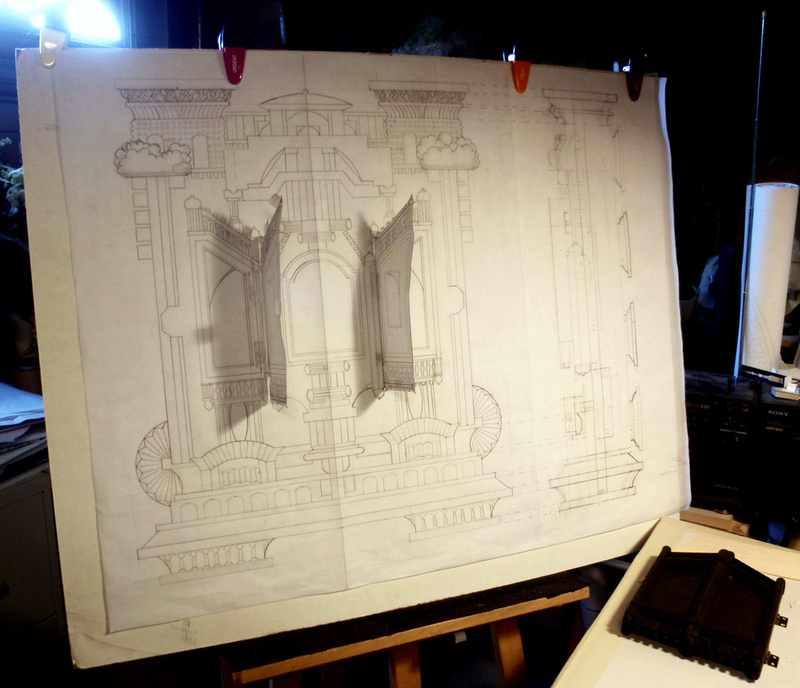 HL: The frame and image arise in conjunction, with the frame usually being made first, but sometimes it is the reverse – painting first, then frame. 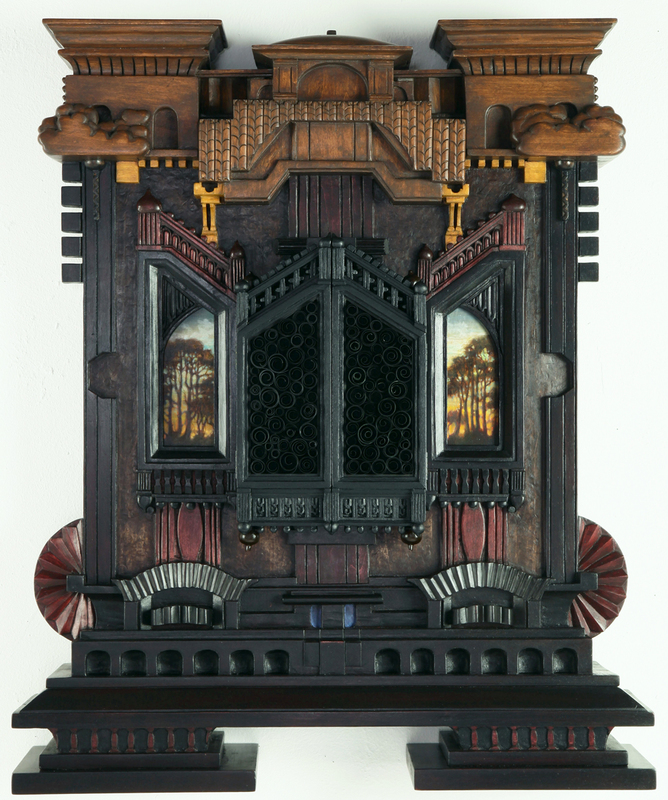 I look at and absorb many things; different art periods and styles, architecture, furniture, antique tools and equipment, textiles, forms in nature; and lately I’ve been intrigued by Southeast Asian ornamentation. All these visual elements circulate in my mind, mix together and reform into something slightly familiar but grown of itself. HL: There was a mix of reaction: some were gratified that I was developing artistically in a new direction, and some were alarmed that I was abandoning my frame/painting constructs. 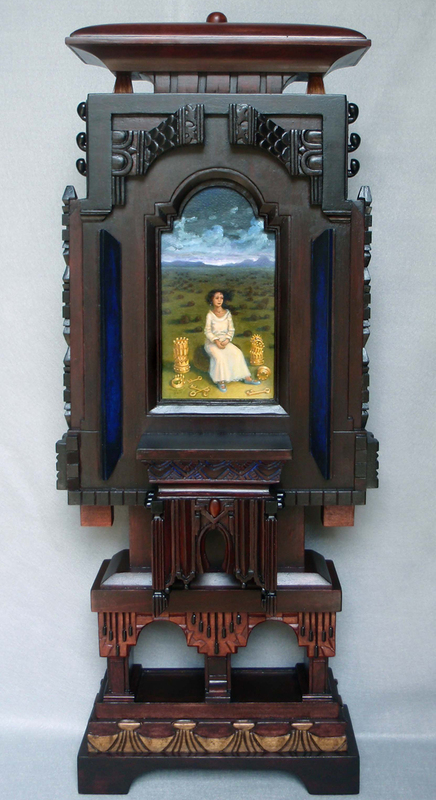 But there was no need for worry – I am steadfastly an additive artist…I make both the carved frame pieces and the sculpture now, and have found that the two feed each other; the pure sculpture has made my frames grow thicker and more elaborate and the carved frame paintings have nudged narrative vignettes into the sculpture. SS: Would there be any particular historical reference that is important to you? HL: As well as the Northern Renaissance, which I’ve mentioned as a fundamental influence, I’m particularly fond of 19th century Romanticism and Surrealism. SS: I’ve noticed that all your forms seem to be from memory rather than strict copying. Do you do copies or sketches of forms such as columns or mouldings, or do you prefer to see them as more generic forms? HL: I carry a small sketchbook with me (and recently a small point and shoot camera) and make sketches or notes of things that catch my eye; including things I see in museums and books. I distill what formally or metaphorically attracted me: a curve, a texture, a colour harmony, a meaningful subtext, etc., then transcribe that distillation into my work – adding a new word to my visual vocabulary. SS: Have you ever noticed or shown with other artists who work with the elements of framing? I have seen interesting pieces in this vein from Mark Ryden. HL: Over the years I’ve seen some work of a few other artists who are thinking about the frame in art magazines, but not much really…it’s been a rather sparsely populated journey. In 1992 my work was included in a museum exhibition that explored how contemporary artists use the frame: Frame up at Fine Arts Center Galleries, University of Rhode Island, Kingston, RI. Though my work was there, I was not able to travel across the country and attend, so I didn’t get to see what others were doing. 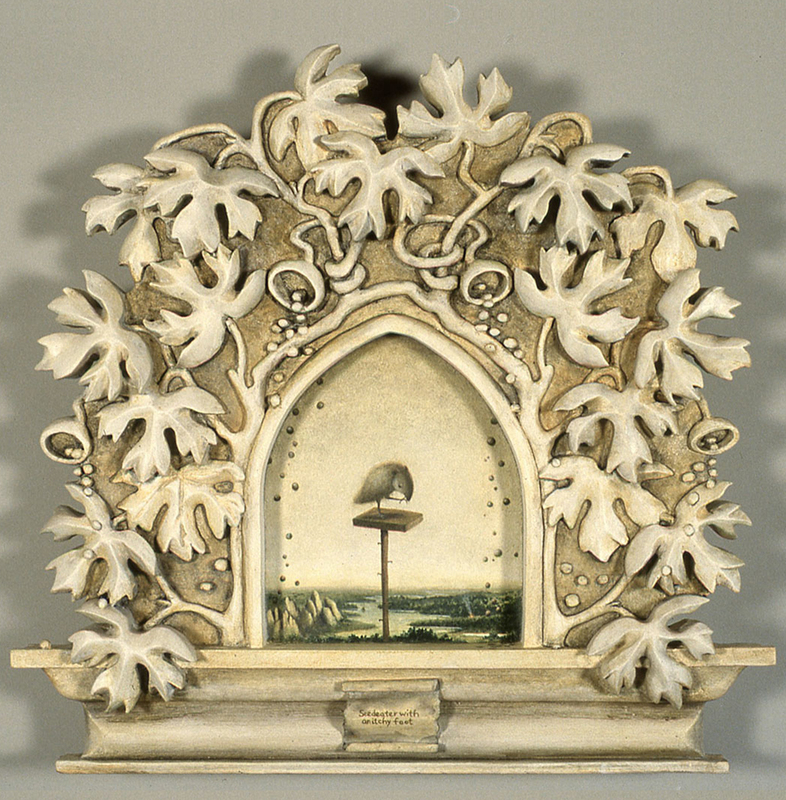 Though I remember, when I was a student, seeing at John Berggruen Gallery in San Francisco the artist Donald Roller Wilson use puckered velvet on some of his frames…he had a casket maker sew it for him, and Roy de Forest would miniaturize and transpose some of his figures; dogs and people onto the frame. I’ve seen Mark Ryden’s work in reproduction and I hope to see it in person one day. His frames serve as a harmonious enhancer to his lush, eerie, socially conscious paintings. SS: As you know, I also have incorporated frames into my artworks, many of them with painted elements on the frames themselves. Have you ever done that, or considered doing that? 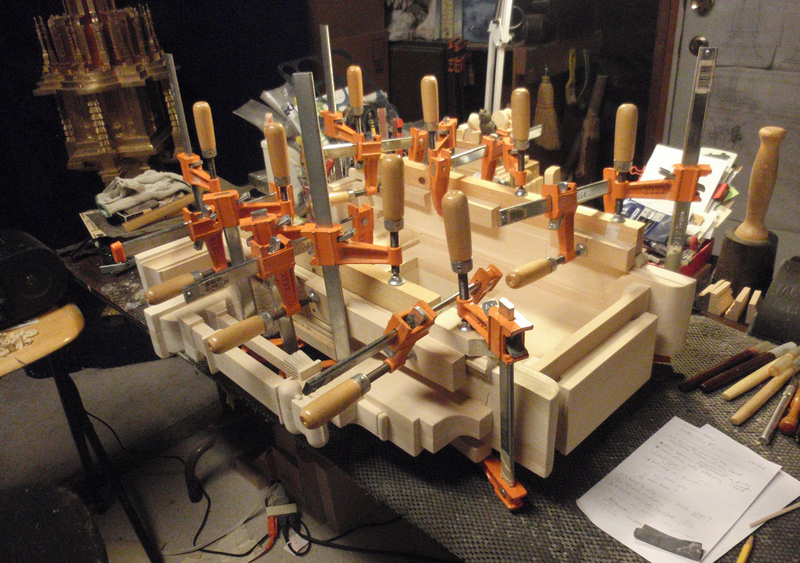 HL: I was delighted to see, online, an in-progress photo of a painted frame of yours (as well as work on your website). I’ve never done anything quite like what you are doing…such refined pictorial articulation on the frame feels daring and trusting. When I consider doing something like that, I get twitchy, because of the damage I’ve seen inflicted on frames. Your question makes me realize how I’ve internalized the practical aspects of mitigating shipping damage into my aesthetic decisions…now I can be more conscious about this practical verse aesthetic aspect. 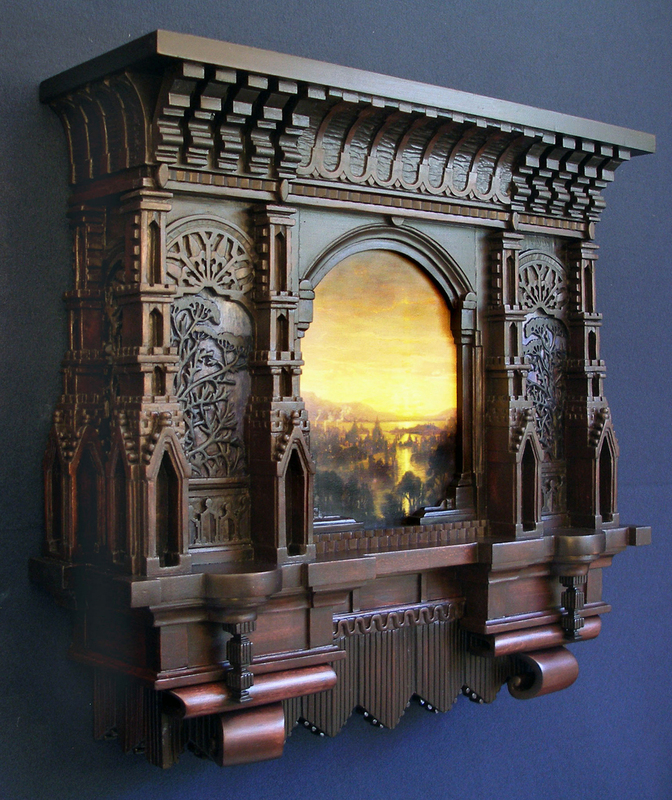 In conclusion…..If asked what were the four things I think about most when making a carved frame/painting it would be the orchestration of forms, proportion, symmetry and gravity. I never tire of proportion; one shape in relation to an adjacent shape, rhyming with, or counter-pointing a distant shape. Our human body plan is based on a bilateral symmetry, therefore incorporating bilateral symmetry in the work can (hopefully) evoke familiarity on an unconscious level. 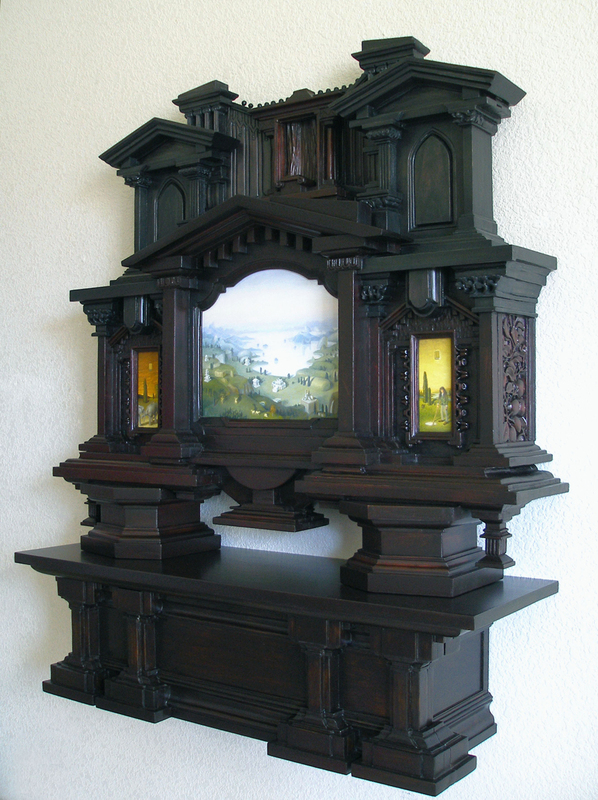 The top or the bottom of each piece has a mantle, spires, feet, or a pedestal form to imply that the work is grounded like architecture, in earthly gravity. Thank you, Steve, for your thoughtful questions; I have enjoyed this opportunity to talk with you about my work. With thanks to Holly Lane for her time, and for all the images, and to Steve Shriver for conducting such an interesting and revealing interview. Steve Shriver is an artist and amateur historian of ornament. Early in his career he worked for a picture framer in Los Angeles, and never lost interest in the possibilities of the frame. Beginning with a commissioned mural in a Pompeiian style, he began a formal study of the history of ornament which continues to this day. He has lectured on the subject for many schools and institutions, including the American Society of Interior Designers and the Institute for Classical Architecture & Art. 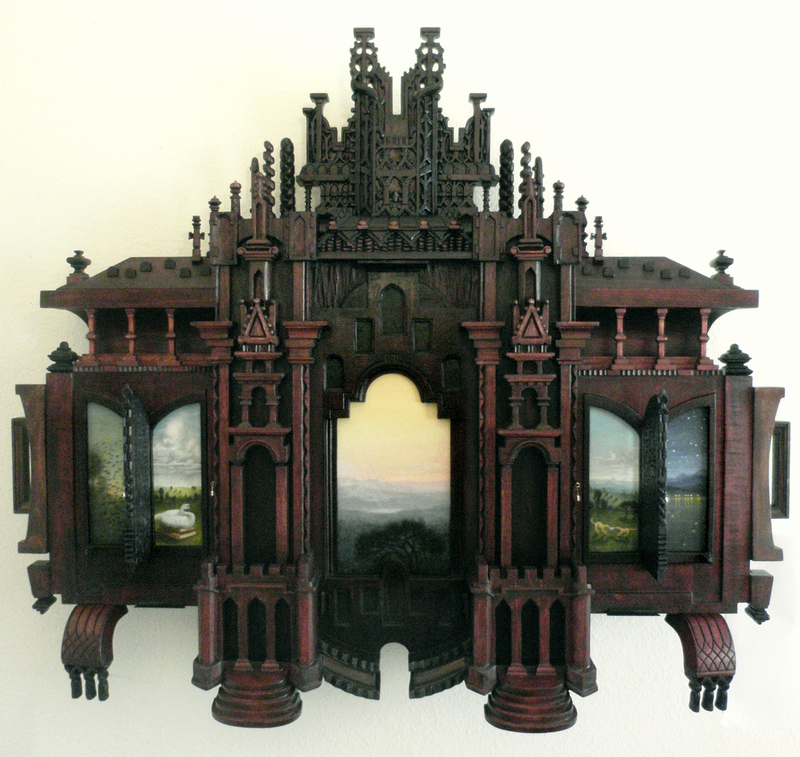 His artwork can be found on his website, and he has a Facebook blog on ornament and art.